Mexico files brief against Utah…federalism at issue? Cutting discretionary spending alone is not going to solve our fiscal woes. Entitlement reform must happen if we’re to maintain our economic strength. That, or raise taxes. A lot. Did you know that federal spending has increased faster than consumer prices? From 2000 to 2010, federal spending has increased 106% while prices (according to the Consumer Price Index) have only increased 26%. In other words, while the cost of stuff has risen only 26%, the government is spending roughly four times more than if it had increased spending to match increased costs. To be sure, a few things have happened in the last ten years that have affected the increase in federal spending faster than consumer prices. There was 9/11 and wars in Iraq and Afghanistan. There was a recession, and there still is a recession. But even so, shouldn’t federal spending increases match consumer price increases, at least somewhat? Mandatory Spending or Discretionary Spending? Right now, a lot of the debate over the size of the federal budget centers around “discretionary” versus “mandatory” spending. As one economist (Arnold Kling) points out, budget items in the later group aren’t so mandatory as they may seem. 2. The government’s “cost of living” goes up much faster than the CPI. For example, with Medicare and Medicaid, outlays are tied to health care costs, and we all know that health care costs are rising faster than inflation. Check out the rest of his analysis here. Noting that, with the exception of “net interest,” every major category in the federal budget has seen an increase in spending greater than the consumer price index, Kling argues that if we cut spending back to 2000 levels–without touching defense, Medicare, or Social Security—we could slash $500 billion from the federal budget. That’s a healthy chunk of change, and a simple idea. Roll spending back to 2000 levels, and then start looking at entitlement reform for other budget constraints and deficit reduction. Get it? Prices have risen only 26%, and federal spending should have risen about the same, even accounting for defense, Social Security, and Medicare. But it hasn’t. Federal spending has increased far faster. Or maybe the answer to the paradox is that when it comes to the Federal Budget, spending is discretionary when somebody proposes an increase in its rate of growth but mandatory when somebody proposes a decrease in its rate of growth. Are politicians really just “the slaves of some defunct economist“? The Federal budget is a curious thing. It alone in the world of finance and spending–from individual home budgets, corporate coffers, Wall Street, and state budgets–is controlled by persons whose primary interest is not responsibility, but reelection, and who spend based on good ideas for benefits, not the realities of economics. Few things secure reelection like bringing home the bacon or signing a revolutionary new program. Yet the law of unintended consequences is stronger than all the political clout or well-meaning programs in the world. So it is: well-meaning Congressmen (and Congresswomen), Senators, and Presidents head off to the marbled halls of Washington, D.C. to make plans and pass laws that their constituents will love back home, solve society’s problems, and make world a better place. Then, the plans hit the real world, and little do politicians know what results will really happen. 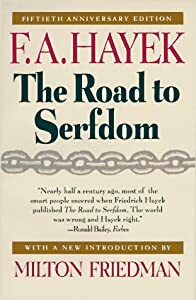 Recommended reading for more: The Road To Serfdom, by F.A. Hayak. Arguments against a Constitutional Convention (also called a Con-Con) are plentiful and rightly so. The last Constitutional Convention resulted in a new government. Opening up the Constitution could be like opening Pandora’s box. In the business world, we have often seen the forces of “disruptive innovation” at work. Harvard Business Professor Clayton Christensen has written best-selling books about the inevitable process of large, bureaucratic, top-down, slow-moving businesses or industries being “disrupted” by small, nimble, innovative competitors using the latest technologies. In business, this process, while deadly for lethargic firms, eventually produces better products, superior customer service, and an upward spiral in efficiency, productivity, wealth creation, and quality of life. This raises an intriguing question: Could the beneficial process of disruptive innovation work in government? Government obviously isn’t subject to the same competitive forces as are private businesses. Government operates by force and coercion, imposing its will by law and regulation, not according to market needs or consumer demand. State legislatures have the right to tell the federal government to back off. They can do it through (mostly meaningless) resolutions. They can do it through bills that slap the feds in the face. They can do it through nullification attempts. They can also call for an Article V convention. On a state level, there are a couple of ways to change the state Constitution. The legislature can pass a bill by 2/3 in both the House and the Senate, then have it ratified by popular vote. Or, we can have a citizen’s initiative where a certain percentage of the population drives the movement to get an amendment put on the ballot. On the federal level, we can have an amendment passed (such as the Balanced Budget Amendment currently being talked about in DC), OR, we could have a Con-Con, OR we could have a state-called amendment convention. If the Founding Fathers were truly concerned with the overgrowth of the federal government – and certainly all evidence points to that as a primary concern – then the inclusion of Article V is not an accident. It was meant to be one more check by the states on the federal government. Look at DC right now and tell me that we don’t already have a runaway government that is acting outside the bounds of their Constitutional authority. We have TARP, we have Obamacare shoved down our throats, we have unelected, powerful czars and we have lame duck sessions where bills like S510 were passed on a voice vote late in the evening, in spite of significant opposition. In addition, we have secretaries – like Ken Salazar, of the Department of the Interior – who have proclaimed that he and his department can now circumvent the Constitution in declaring wild lands and departments like the EPA who regulate by rule when they can’t get the laws they want passed by Congress. As someone who loves the Constitution, and who loves this country, I am tired of rolling over and letting the federal government trample our rights. I believe we SHOULD use the tools the Founding Fathers gave us to push back against this egregious federal over-reach and for this reason, I support the states banding together and proposing an Article V amendment convention. —Reprinted with permission from Utah State Representative Holly Richardson. Find the original post here.